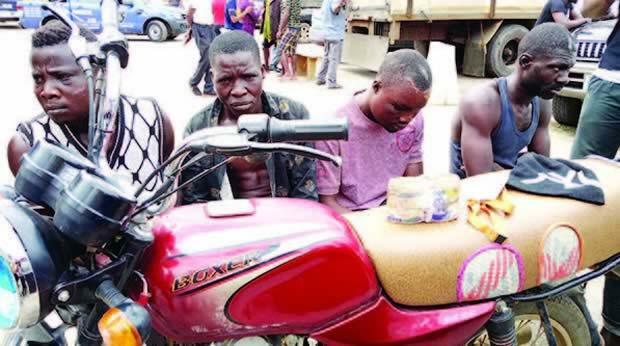 A gang of robbers have met their Waterloo at Morogbo, in the Badagry area of Lagos State after they were caught for robbing a bank customer of N250,000. The suspects were beaten to a pulp by a mob before they were handed over to policemen from the Morogbo division. It was gathered that the men – Saka Ibrahim (25), Oni Kudaisi (35), Sodiq Dauda (28), and Taiwo Popoola (24) – waylaid their victim, who had just withdrawn the money from an Access Bank branch at Car Wash bus stop on Friday. The gunmen reportedly collected the money, shot into the air to scare residents and fled on two motorcycles they brought for the operation. Some community youths, including motorcycle riders, were said to have summoned courage and gave the hoodlums a chase. The gunmen were reportedly caught in the Ibiye area, where they had tried to mix with a crowd to escape detection. The bank customer, who identified himself only as Cletus, said the four-man gang trailed him from the bank. He said, “I withdrew the money on Friday at a branch of Access Bank at Car Wash bus stop. I boarded a bus which took me to Magbon. After I alighted and crossed the road, I heard someone saying, ‘That is the man we are looking for.’ One of them came towards me and tried to collect the money. A resident, who saw what was happening, raised the alarm that they were robbers. “I held the man trying to collect my money and as we struggled, another member of the gang came, hit me, forcefully collected the money and shot into the air. A senior police officer said policemen at the Morogbo division, led by the Divisional Police Officer, SP Adagba Johnson, blocked the road to prevent the suspects from escaping. “Since people knew the robbers would pass in front of the police station, they called to alert the division. “The DPO, upon getting the information, blocked the road with a team of policemen. When the suspects saw that the police had blocked the road, they made a U-turn and faced Magbon where they were coming from; they were caught between the mob and the police. They then diverted into a community called Ibiye. “We discovered that they all lived in the area and thought they could easily escape since they knew the terrain very well. The police joined the residents and got them arrested,” he said. An eyewitness and community youth leader, who identified himself as George Bush, told The Punch that the men usually robbed bank customers in the area. He said, “The boys seemed to have informants in the bank area. They go there at least twice a week to collect money from people. The suspects, who were paraded at the Lagos State Police Command headquarters, Ikeja, on Tuesday, confessed to the crime. The men also said the robbery was not their first. Ibrahim, who claimed to be a welder, said he had gone on four operations with the gang, adding that he made between N30,000 to N40,000 from each operation. “A man called IB gave us the gun. I met him at Oko Afo bus stop. He owed me N10,000 and asked me to add N10,000 to it to collect the gun. “One TJ gave us information about bank customers that we robbed of their money, but he has fled,” he added. Another suspect, Kudaisi, an indigene of Ondo State, said he followed the gang for the operation because he needed the money for his cobbler vocation. The third suspect, Dauda, an indigene of Oyo State who claimed to be a motorcycle rider, said he usually took members of the gang to robbery scenes. “I have taken them only twice. After the first operation, I was given N15,000. This is my second operation with them,” he added. The fourth suspect, Popoola, claimed that he went into robbery because he was homeless. The Lagos State Commissioner of Police, Edgal Imohimi, said the police recovered from the suspects one locally-made double-barrelled pistol loaded with two live cartridges and a Bajaj Boxer motorcycle. He noted that the stolen N250,000 was also recovered, adding that they would be charged to court at the end of investigations.